Runtime: 4 hr. 15 min. Verdi and his librettist and friend Francesco Maria Piave based La forza del destino on Ángel de Saavedra's highly dramatic play Don Alvaro, o la fuerzo del sino, and also incorporated material from Schiller's Wallenstein's Camp for Act III's military scenes. 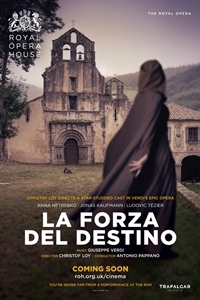 Following Forza's 1862 St Petersburg premiere, Verdi made extensive revisions to the score. The most substantial of these were a new overture, and a less melodramatic ending, in which Don Alvaro remained alive rather than committing suicide. The revised Forza, the version best known today, had its premiere on 27 February 1869 at La Scala, Milan.Premium Event presentation, $18.50, $15 senior/child.